Sulphur-crested cockatoo Cacatua galerita, photographed by Mfunnell. 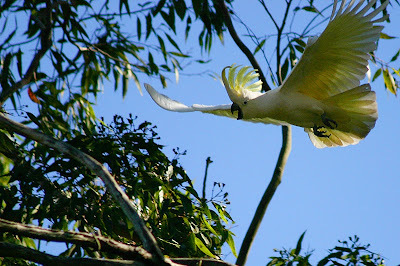 The Cacatuini includes the cockatoos, mostly large, noisy and gregarious parrots found in Australasia and the islands of south-east Asia. They are characterised by the presence of a long erectile crest (Rutgers & Norris 1972). [CW03] Cooper, C. E., P. C. Withers, P. R. Mawson, R. Johnstone, T. Kirkby, J. Prince, S. D. Bradshaw & H. Robertson. 2003. Characteristics of marri (Corymbia calophylla) fruits in relation to the foraging behaviour of the forest red-tailed black cockatoo (Calyptorhynchus banksii naso). Journal of the Royal Society of Western Australia 86 (4): 139-142. [JK08] Johnstone, R. E., & T. Kirkby. 2008. Distribution, status, social organisation, movements and conservation of Baudin's cockatoo (Calyptorhynchus baudinii) in south-west Western Australia. Records of the Western Australian Museum 25 (1): 107-118. [KK05] Kloet, R. S. de, & S. R. de Kloet. 2005. The evolution of the spindlin gene in birds: sequence analysis of an intron of the spindlin W and Z gene reveals four major divisions of the Psittaciformes. Molecular Phylogenetics and Evolution 36: 706-721. [R85] Robertson, C. J. R. (ed.) 1985. Reader’s Digest Complete Book of New Zealand Birds. Reader’s Digest: Sydney. [ZJM03] Zeffer, A., L. C. Johansson & Å. Marmebro. 2003. Functional correlation between habitat use and leg morphology in birds (Aves). Biological Journal of the Linnean Society 79: 461-484.